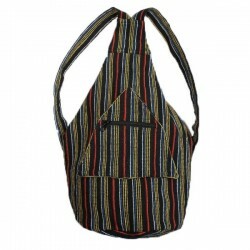 This purse has been made from jute which consists of two zipper compartments one at the top and the other at the side. Its soft inner lining helps to keep its contents safe and secure. It is designed with a number of colourful rectangular patch work and comes weighing 25 grams with a loop for free hand carriage. A nice scarf of flimsy cotton with medium sided stripes of different colours with ends pleated trinkets. It keeps the neck and head warm. This scarf is available in different colors, such as, deep, pale, bright and light. The scarf is light yet warm and colorful. It is a perfect scarf to brighten up your look.